The other side of the range coin is charging. With inductive, wireless charging lining the highways, short range wouldn’t matter. With cars that have several hundred miles of range, core destination charging is probably all you’d need. Of course, we’re currently somewhere in between these two extremes. Since we just discussed range, let’s tackle charging. 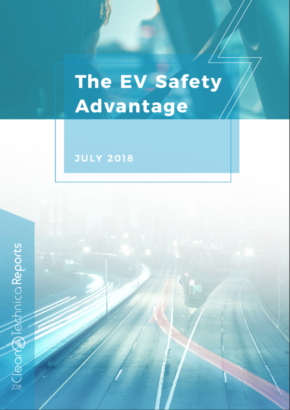 I’ve already covered charging in a few sections of this report, and I think it’s useful to recap the highlights in order to quickly show how charging is a double-edged sword for electric cars. First of all, we found that convenient home charging was one of the key benefits of an EV lifestyle. It was the fourth most popular benefit of EVs according to EV drivers, with 11% choosing it as their favorite benefit. 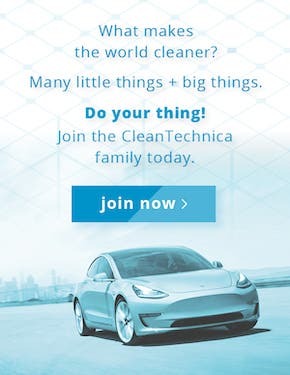 Non-EV owners/lessees put it as #2 overall, only trailing the climate and air quality benefits of EVs. 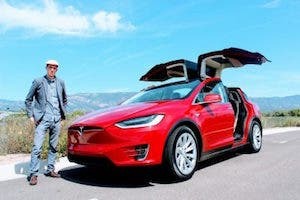 When asked about the importance of Tesla’s Supercharger network (or some comparable super-fast charging network), 65% of potential owners indicated they would be significantly more attracted to a fully electric model if it had access to Tesla Superchargers or something comparable. (Note that Tesla’s Superchargers charge a car about twice as fast as the next-fastest DC fast chargers on the market.) Only 11% of respondents didn’t care about having access to such a network. I also asked this question but in relation to a PHEV/EREV. 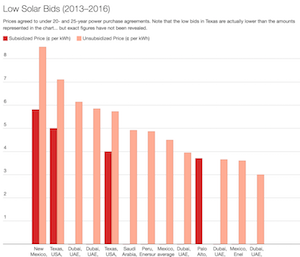 As would be expected, the importance of access to Tesla’s Supercharger network or some comparable super-fast charging network was not so strong. However, some respondents still considered it a big deal. 22% of potential owners indicated they would be significantly more attracted to a PHEV/EREV electric model if it had access to Tesla Superchargers or something comparable. 26% stated they’d be slightly more attracted to such a model. 52% of respondents didn’t care about having access to such a network. 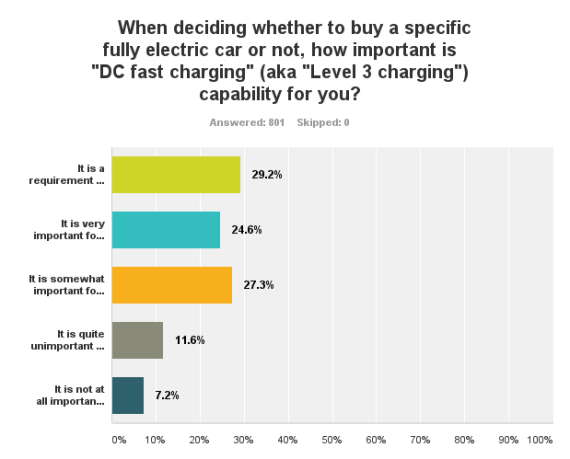 In a separate survey for both EV drivers and potential EV drivers, 29% of respondents indicated that DC fast charging was a requirement for them to consider a fully electric car, 25% indicated that it was very important for them, and 27% indicated it was somewhat important for them. Only 12% indicated it was “quite unimportant” and 7% “not important at all” for them. When asked about the importance of a 6.6 kW onboard charger over a 3.3 kW onboard charger, 32% considered a 6.6 kW onboard charger a requirement, 24% considered it “very important” for them, and 26% considered it “somewhat important” for them. Only 9% said it was “quite unimportant” and 9% not important at all. 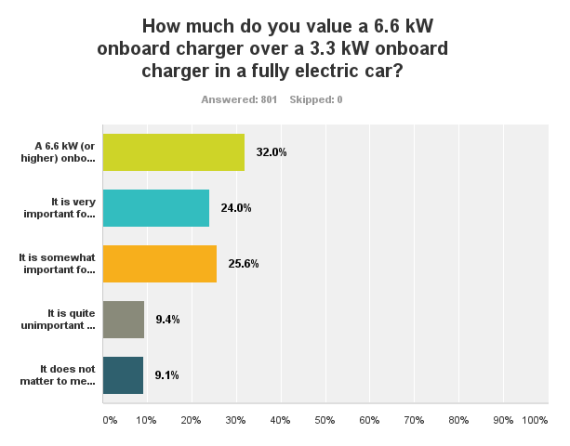 The importance of a 10 kW or greater onboard charger over a 6.6 kW onboard charger was less important to people, with 11% considering it a requirement, 16% “very important,” 34% “somewhat important,” 17% “quite unimportant,” and 22% not at all important. 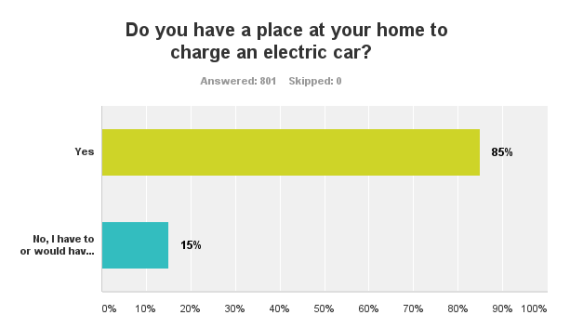 Probably critical to the responses, 85% of respondents in this charging-focused survey indicated they had a place at home where they could charge. 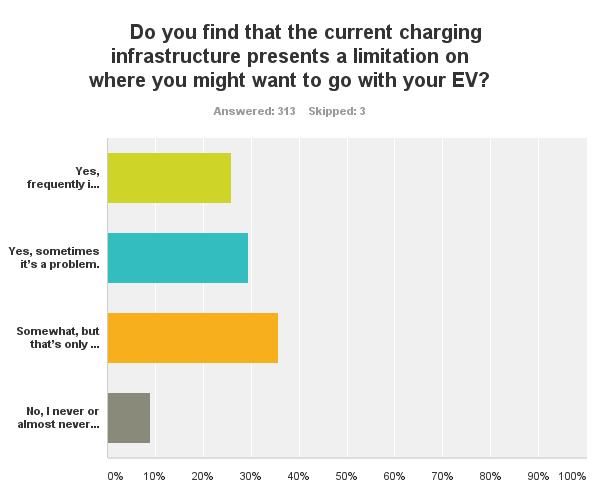 In yet another survey focused on charging, but only for EV drivers, 26% indicated that they frequently find that current charging infrastructure presents a limitation on where they might want to go with their EV. 29% indicated that it sometimes presented a problem, and 36% indicated “somewhat, but that’s only an issue on long trips.” Only 9% indicated that it never presented a limitation for them. 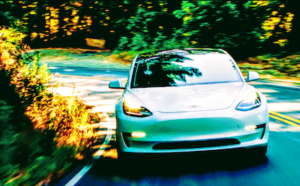 Note that ~30% of respondents drove a PHEV/EREV and ~28% drove a Tesla, indicating that even for the most range-blessed EVs on the market, lack of charging infrastructure still presents limitations in the eyes of owners. Importantly, the charging station market is still very diverse. 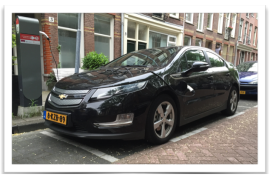 This presents some challenges for EV drivers. 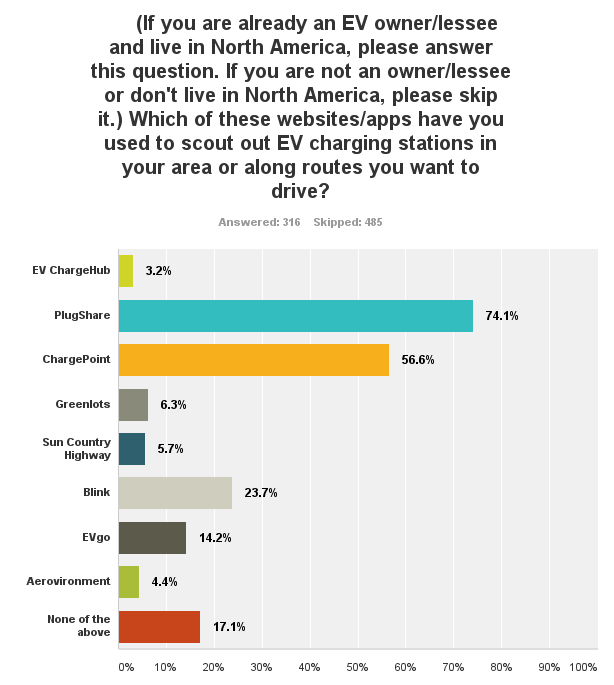 I asked EV drivers which of eight EV charging websites/apps they had used to scout out EV charging stations. 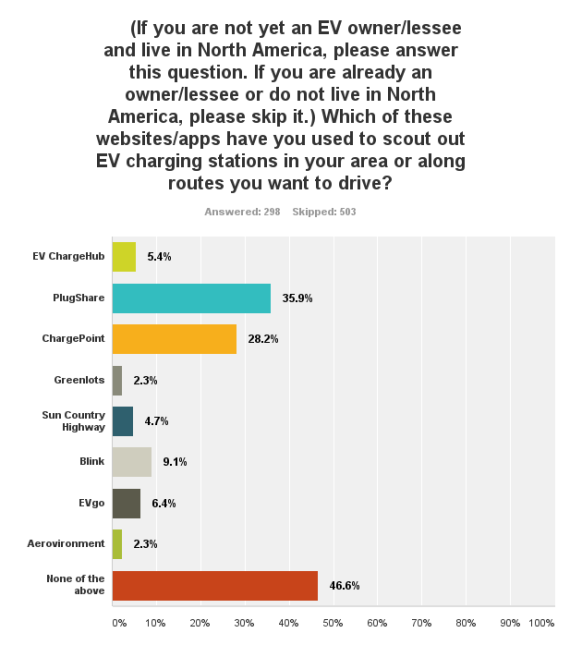 74% had used PlugShare, 57% ChargePoint, 24% Blink, 14% EVgo, 6% Greenlots, 6% Sun Country Highway, 4% Aerovironment, and 3% EV ChargeHub. Surprisingly, 17% hadn’t used any of them. I also asked non-EV drivers this question, curious to see how aware they were of these services. A whopping 47% hadn’t used any of them. 36% had used PlugShare, 28% ChargePoint, 9% Blink, 6% EVgo, 5% EV ChargeHub, 5% Sun Country Highway, 2% Greenlots, and 2% Aerovironment. 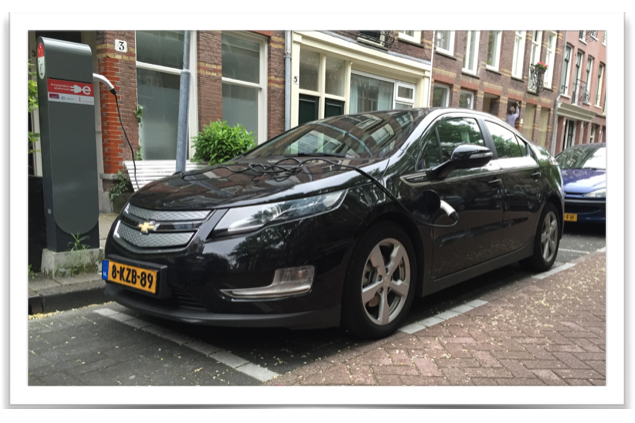 Without a doubt, the charging industry needs to mature a lot in order to enable widespread adoption of EVs. It is at a very early stage of development. 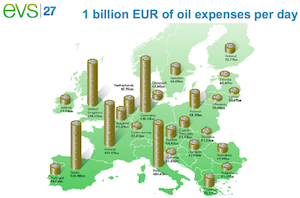 The industry also needs EV adoption to grow in order to enable financially sustainable business models. The electric car and EV charging markets are growing together (natch), and it will be interesting to see where things stand in 10 years.